I came upon some random "history" the other day, and thought it would be fun to share - so here goes! "In 1956, William Mitchell, a General Foods chemist, was looking for a way to make instant carbonated soda pop by trapping carbon dioxide in hard candy tablets. One afternoon he popped some nuggets he was experimenting with into his mouth...and felt them pop. No one at General Foods could think of a use for the substance, so it was shelved for almost 20 years. 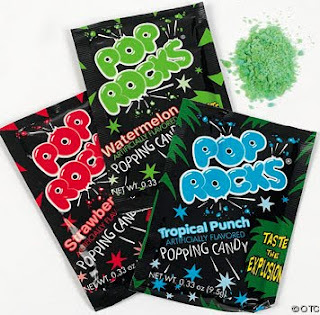 But in 1975 it was introduced as Pop Rocks - and became the hottest selling candy in history. Between 1975 and 1980, more than 500 million packets were sold." Leave as a surprise on the table when your kids come home from school. Give as a good luck/congrats token to a friend.